A unique and glamorous book about British Imperial and post-Imperial architecture and a lively and evocative read for anyone interested in the international projection of British power and culture. 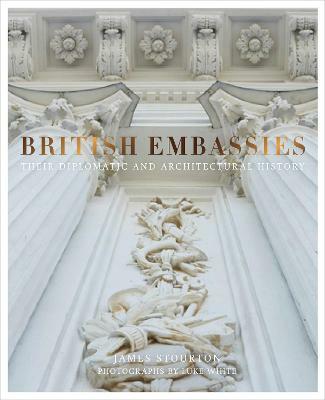 British Embassies have a special role in our history. They represent our country in bricks and stone and have often expressed - at least in the eyes of foreigners - our national character. Whether they are Lutyens buildings in Washington, grand palaces in Europe, beautiful old colonial buildings in Asia, or secure compounds in the Middle East, they all have stories to tell and reveal the changing face of British diplomacy. A mixture of history, architectural description, diplomacy and anecdote, this large format picture book covers Residences and embassies in twenty-six countries to provide an authoritative text, accompanied by newly commissioned photography. James Stourton is the prize-winning author of five books including Great Houses of London and the authorised biography of Kenneth Clark; Life, Art and Civilization. He is a former Chairman of Sotheby's UK, he sits on the Heritage Memorial Fund panel and the Acceptance in Lieu panel and is a senior fellow of the Institute of Historical Research, London University. Luke White's photographs have been widely published in interior design and architectural magazines including Architectural Digest, Vogue and Homes and Gardens. His books include Sally Storey's Lighting by Design and The Irish at Home by Jane and Sarah McDonnell.